The Fourth Way tells us that every human being has the potential to realise that they are created as a full and true reflection of the whole universe. Sometimes a moment of Pure Consciousness allows us to know this for a moment but usually we exist at a much lower level, convinced we are separate, isolated beings at the mercy of forces in the world and other people that we cannot forecast or control. 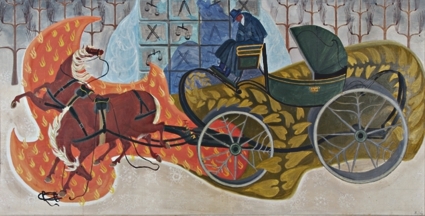 The Fourth Way presents a view of a human being as a house of seven rooms, or centres. Each centre receives energy and motivation from all the levels of the Universe: the sun, the planetary world, the biosphere, the moon etc. At different levels of consciousness we allow ourselves to experience and be motivated by different levels of the creation. The ‘centres’ of Ouspensky’s system are strikingly similar to the concept of chakras described by the various Yoga teachings. Chakras can be thought of as transducers of energy from the subtle level to the physical. The mechanism, as always, is a threefold system, a triad, so that the subtle energy conveyed by the chakras is converted and distributed by means of the endocrine glands and the plexuses of the autonomic nervous system. 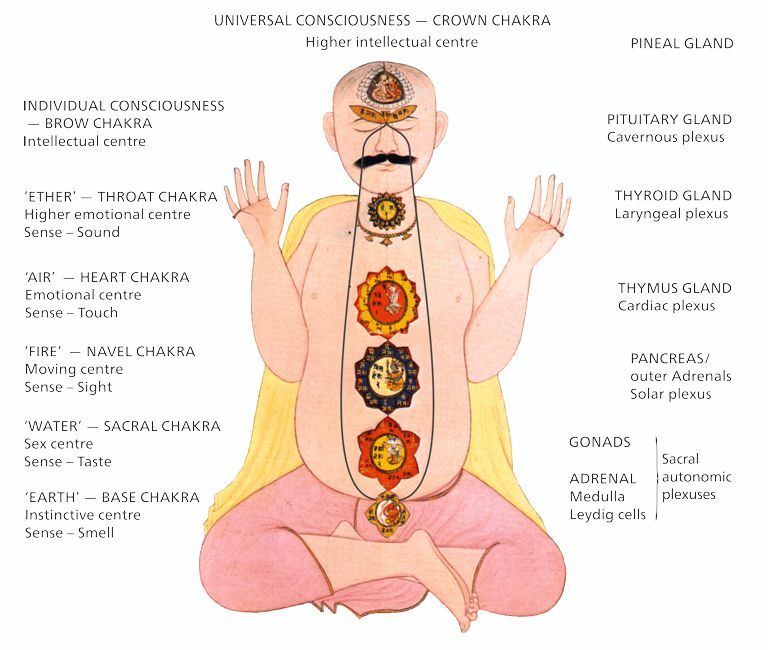 This picture, derived from the Yoga system, is one way to show how all the energies in the universe are channelled in the human body. 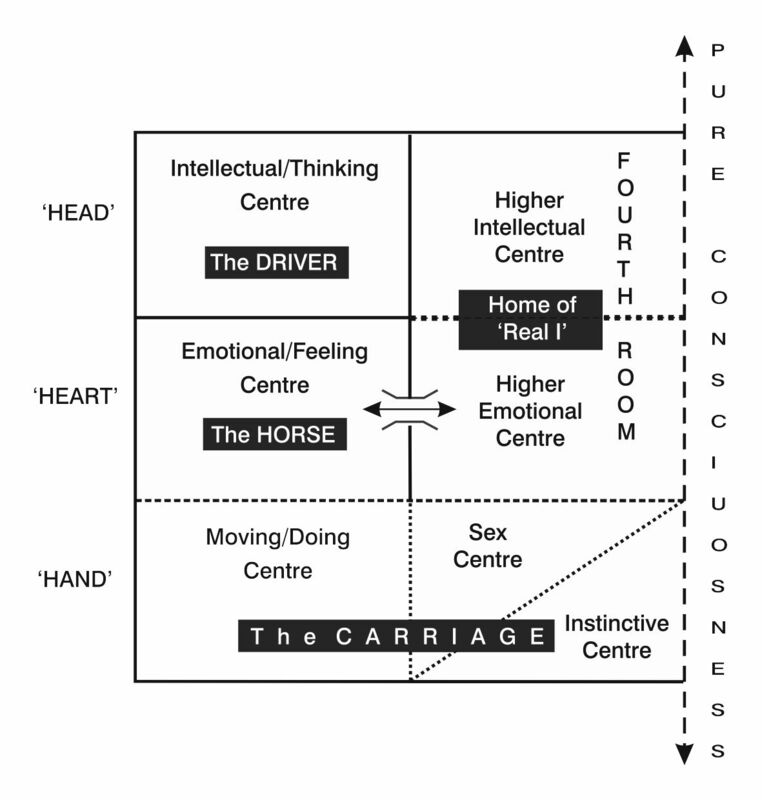 In our usual state of ‘waking sleep’ we are controlled by the three lowest centres which are focused on our physical existence. The seven chakras, or centres, represent the seven levels of the human cosmos which are directly connected to the corresponding levels of the greater cosmoses of the biosphere and the planetary and solar worlds. The reception and transmission of energy between the cosmoses is constantly flowing and essential for the life of them all, whether we know it or not. The practice of stillness and the further refinement of the energy that fuels the higher faculties of mind and emotion allow this natural interaction to become a consciously felt experience. The distribution of energy in the whole human organism is sustained by a principle of bilateral symmetry. Just as there are two complementary hemispheres of the forebrain, each part of every centre is fuelled by a pair of ‘accumulators’, acting like rechargeable batteries. While one is filling up, the other is discharging; and vice versa. Only in the fourth room is there one single, large accumulator containing all the energies required to keep all the small chains of accumulators charged and ready for action. This large accumulator is the energetic aspect of the ‘Real I’, and except in the direst physical emergencies remains for the most part inaccessible – which is generally a good thing, for when the large accumulator is completely emptied, we die. In abnormal circumstances, when a negative emotion becomes so intense that it connects with the large accumulator, we can find ourselves drained of energy for weeks and months. In extreme circumstances this can even cause death.